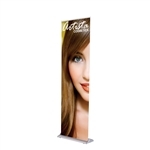 The most simplified trade show displays - normally set up by 1 person in 1 minute by extending the banner from the base. Banners are often stored within the base that doubles as a case. 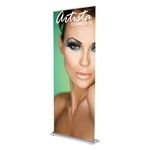 Very portable, these lightweight stands are a great inexpensive option for standalone trade show signage. 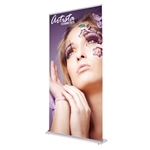 Not sure which retractable banner stand suits your needs? 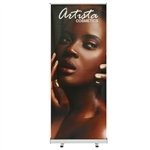 Check our retractable banner stand comparison so you can make a wise choice.